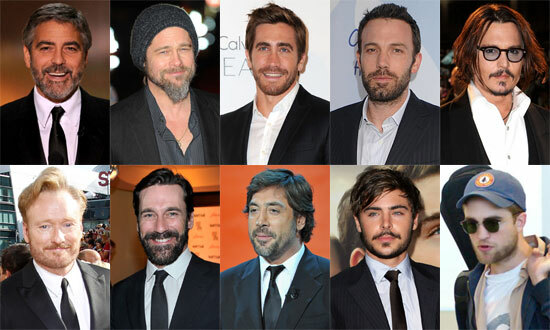 2010 was the year of the celebrity beard! It seemed like every male star made headlines for facial fuzz, experimenting with a mustache, or for shaving it all off. Some grew out their facial hair for a role, while others took advantage of downtime to let their stubble shine. So, tell us — who do you think had the best beard of the year? Well at least they meant facial hair. And Brad's beard got really ugly before he shaved - that pic is not representative of how unkempt and ugly it was. The funniest thing is...in that photo Zac Efron looks like a girl dressing up like a guy with fake beard & moustache...ROFL! Katie's forum photo, imho, is George's best beard. Maven is SO right. There's really not a great lloking beard among the nominees. Honestly, Tom Selleck's mustache kind of defines him. Unless you're such a lover of male facial hair that you think ALL men should have a beard or mustache, these guys all look better clean-shaven.